There's a new biennial show of fiber art in town. It's called Intertwined: Contemporary Southeastern Fiber Art, and it runs through March 21 at the Hudgens Center for the Arts at the Gwinnett Civic Center in Duluth. I had the pleasure of attending the opening reception last Saturday night. A few days ago I went back to the gallery for a closer look at the art. This time I was even more impressed by the innovative approaches of several fiber artists working in the Southeast. Let's be frank: too often fiber art begins and ends with technical mastery. Conceptual content can be weak. The best work in this show goes far beyond technique and grapples with real contemporary issues, both in the art world and in the world at large. Jim Arendt's piece Totemic Figures (see left) was awarded Best in Show. 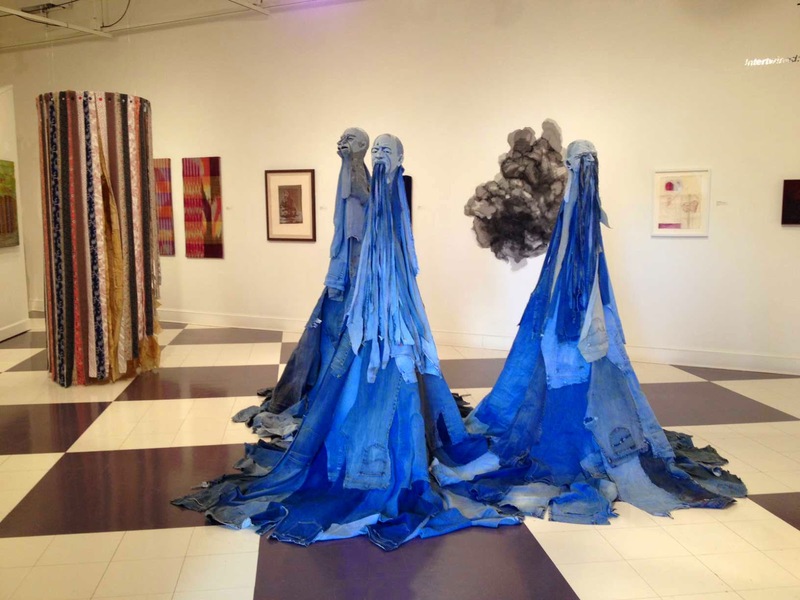 Three monumental figures clad in flowing layers of cut-up blue jeans dominate the modest-sized gallery. 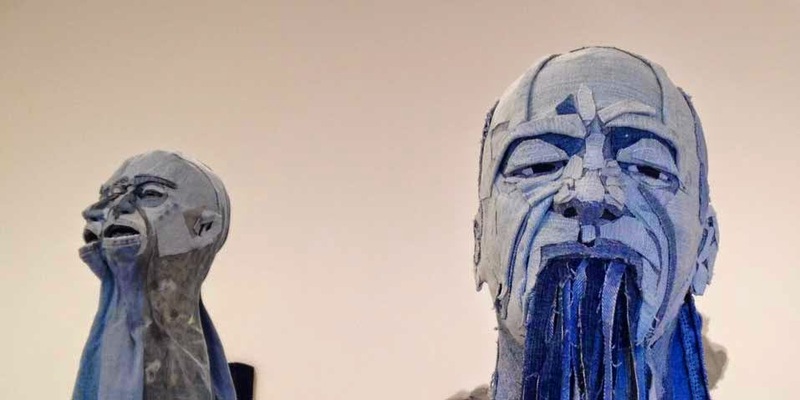 In two figures, strips of denim pour out from the mouth and eyes. The third figure has a double face. The effect is disquieting, threatening and mournful all at once. The sheer abundance of the recycled blue jeans reminds me of the mountains of cast-off clothing at my local charity, waiting to be sorted through. I also think of textile workers who sacrifice their health and sometimes their lives in far-away factories, making our disposable fashions. Doubtless other viewers will find other meanings. There is fine craft here--the faces are depicted with amazing realism in carefully constructed layers--but the piece is much larger, in both senses of the word, than fine applique. 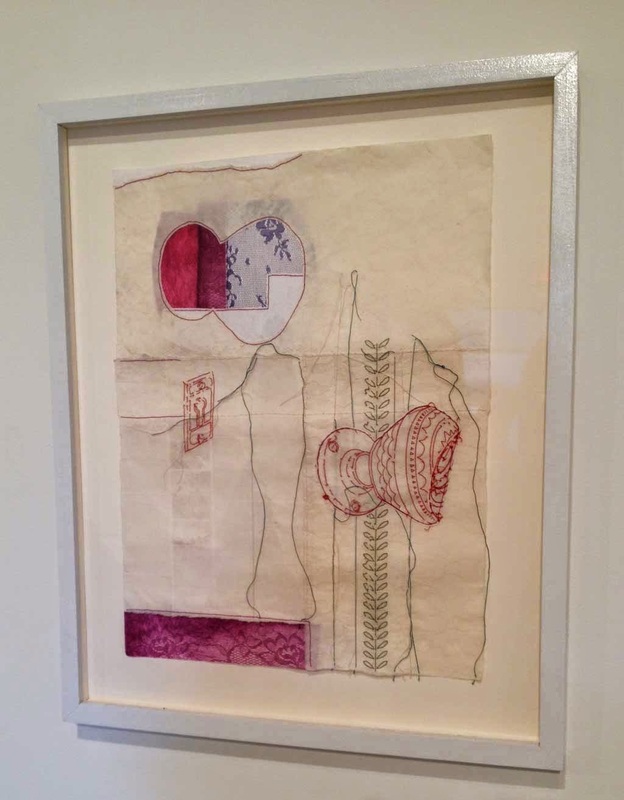 Another piece that pushes a traditional technique into new territory, and one of my own favorites, is Cassidy Russell's Removing/Shifting (Doorknob), a work of machine and hand embroidery on layers of paper. (Apologies for the off-kilter photo--I had to shoot at angle to avoid a distracting reflection.) For me the paper substrate lends the piece the aura of an obscure text, an enigmatic poem. Stitches hint at a mystery: what is behind the doorknob, if I were to grasp the edge that folds out from the page? What would I see through the keyhole? The precise stitches form frilly patterns suggestive of women's clothing, perhaps hinting at a domestic secret. This piece alludes to traditional decorative textiles without itself becoming one. Loose ends are appropriate here. 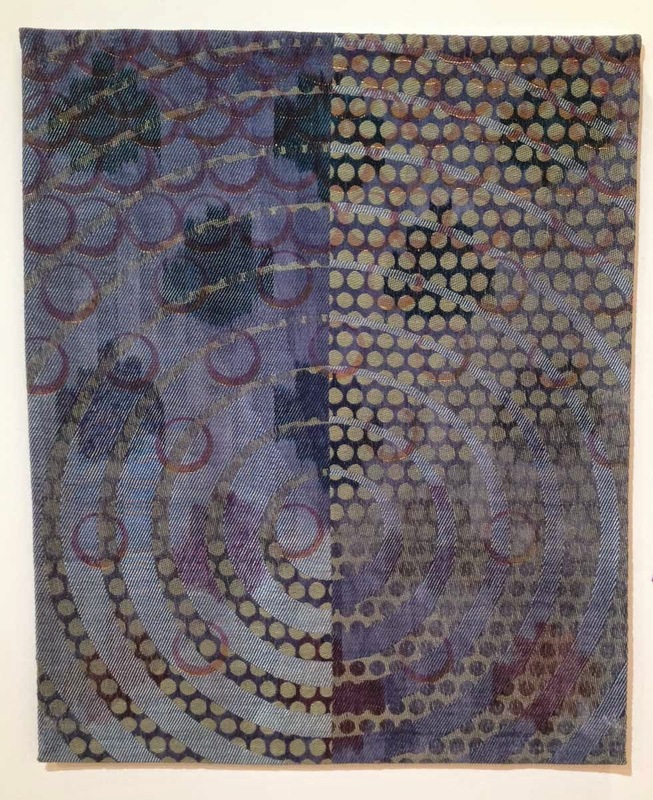 While work involving quilting, sculpture, embroidery, printing, painting, felting and mixed media techniques is on view, for me the innovative weaving stands out. A number of pieces held my interest; I will limit myself to one here. Robin L. Haller's piece All of Your Tears (photo below) garnered an Honorable Mention. Large circular patterns float over several small circular patterns. The piece is divided vertically in half--an intriguing composition also used to great effect by Ann Roth in Serendipity--and yet color, line and shape create an all-over unifying pattern. Haller's digitally driven TC-1 loom makes possible intricate combinations of weave structure, yet finally I was charmed most by the irregularities of the ikat-dyed warp, and the glint of hand-stitched gold threads. 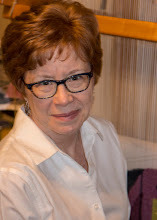 Juror and judge Dorothy Moye states that the show reveals a "spectrum of techniques, concept, materials, execution, and global awareness transcending any hint of a regional fiber ghetto." This show does display the incredible variety of media and approaches in contemporary fiber art. Many group fiber shows do that. This exhibit demonstrates that the best fiber work being done today can stand beside the best contemporary work in any medium. Fiber artists are used to their work being "ghettoized," segregated in fiber-only shows. Traditionally fiber art has been marginalized as craft, as women's work, as amateur and domestically oriented, lesser than the "high arts" of painting and sculpture. Fiber-only shows have offered and continue to provide important opportunities for exposure and visibility to fiber artists. At the same time, however, these shows can fall into the trap of celebrating astounding technical achievement devoid of fresh content. Intertwined is a pointed reminder to me and to all of us who work with fiber to keep pushing the conceptual content of our work. This show is sponsored by Atlanta's Southeastern Fiber Arts Alliance, (SEFAA) in honor of the organization's fifth anniversary. Also on view are works by five artists chosen by Ray Pierotti in recognition of their outstanding contributions to the growth of SEFAA: Jennifer Crenshaw, Lynn Pollard, Leisa Rich, Tommye McClure Scanlin, and Karen Tunnell. Uniquely among the artists represented, Dahlonega tapestry weaver Tommye Scanlin was selected for both parts of the show. The show is on view through March 21 at the Hudgens Center for the Arts at Gwinnett Civic Center, 6400 Sugarloaf Parkway, Duluth, 30097. A catalog of the show will be available mid-February at the Hudgens or from SEFAA at 1705 Commerce Dr. NW, Atlanta, 30318 or online. The show will travel to The Unitarian Universalist Congregation of Atlanta (March 23- April 21), Lamar Arts in Barnesville, GA (May 1-June 27) and Annette Howell Turner Center for the Arts in Valdosta, GA (Aug. 3-Sept. 16). Go! See the show and tell us what you think! I clearly remember when I began as a quilter, over twenty years ago, to get itchy and restless with following traditional predetermined patterns. I think I was making my second or third quilt when I thought, "What if I just change the color of this row of blocks right here?" 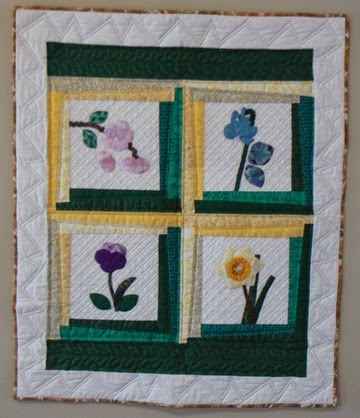 On my next quilt I decided to add skewed frames and wonky jagged quilting to my decorous applique flowers, and then there was no going back. For me the next logical step was to take classes in Surface Design and Fiber Construction at the University of Louisville's Alan R. Hite Art Institute. I realized I would be a more effective designer of my own work if I had a little professional instruction. Or a lot. One class led to another, and before I knew it I was working on a Master's degree in Studio Art with a focus on Fiber. It was a great, mind-expanding experience that changed my artistic practice, and my life, forever. What if you'd like to take your work to that next level, but you can't put your life on hold to take college classes in art? Or perhaps you've taken workshops and classes with artists and makers who've had you reproducing the techniques they are known for. You learn some new skills, but you don't learn how to make your own work. That's why I've developed a two-and-a-half day intensive class in design--Approaching Design Step by Step--intended to get you comfortable with using a sketchbook (you can call it a visual journal if you like), generating lots of ideas and samples, and learning the lingo of the Elements of Art and Principles of Design. These aren't hard and fast rules so much as they are basic concepts that help you understand what you see when you look at your own work or anyone else's. They are sort of a magic decoder ring for visual art. When I began to understand concepts like value, contrast, and proportion, I felt as though finally I could put into words that uneasy feeling I'd get when something about my design wasn't working but I just couldn't put my finger on it. I'll be offering this class at a fantastic venue in April--the renowned Arrowmont School of Art and Craft. It's part of the biennial Fiber Forum weekend conference, featuring nationally and internationally known artists and students in a wide variety of fiber media. It's a great time to hang out with the fiber tribe, work at what you love all day, and not have to fix any meals or run any errands. There are vendors of fiber supplies, two exhibits of work, and a fashion show. Add in the fact that the campus is a wooded enclave in the heart of the Smoky Mountains in Gatlinburg, Tennessee, at the height of spring, and you get the picture of how special this weekend will be. Go ahead, check it out. Hope to see you there! Yes, this blog is titled "talking textiles"--so why is this post about a sound installation? Stay with me here and I'll explain. The Forty Part Motet by Janet Cardiff, on view in the contemporary galleries at the High Museum in Atlanta, has had its run extended to Feb. 15. You owe it to yourself to visit this amazing sound installation if you are near Atlanta anytime in the next few weeks. And if you're not, you may want to find a CD of Tallis' music. mesmerizing reworking of a 40-part choral piece by Tudor composer Thomas Tallis (ca. 1505-1585). The installation features the voices of 59 singers (adults and children) performing Tallis' Spem in Alium Nunquam Habui (1556), which translates to In No Other is My Hope and is perhaps Tallis' most famous composition. Each voice was recorded separately, and all voices are played back in unison via 40 individual loudspeakers on tripods (one speaker for each choral part). The audio component features a 14-minute loop – 11 minutes of singing and three minutes of intermission. Photo courtesy of High Museum website. For me the piece was magical in several ways. First, Tallis' music is haunting, ethereal, soothing and meditative. The voices are pure and profoundly moving, to this listener at least. You don't have to understand Latin, or subscribe to the religious feeling that inspired this music, to find it moving. Then too, it is wonderful to watch museum visitors enter the space and fall under the spell of the music. As visitors work out how the sound is connected to the speakers--each speaker emits only one voice, so some are silent while others are playing--they begin to walk slowly around the room, listening to each speaker and each individual voice. The familiar museum shuffle that visitors do around the perimeter of a gallery, peering at each piece on the wall, here becomes a shuffle of listening within the circle formed by the speakers. The speakers are placed at the height of an average adult's head, so one encounters the voices as one might meet fellow humans. After making the full circuit, some visitors pause in the center and allow the music to wash over them for a few seconds, or minutes. The secular white cube of the contemporary gallery becomes a sacred place of awe, wonder and joy as a very old piece of music is made new. I think it is the very juxtaposition of the old and the new, the sacred and the secular, that makes this installation so effective. 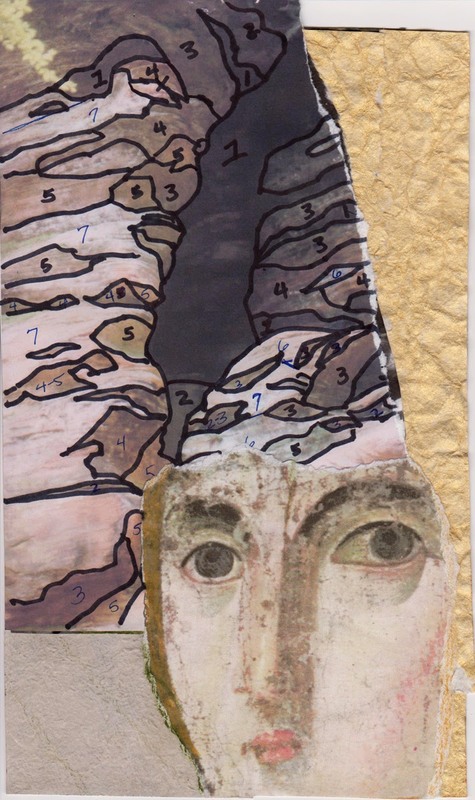 This principle of juxtaposing contrasting and unexpected elements together, of cutting and pasting, is the basis for collage, assemblage, and much other contemporary art. It is also currently my preferred method of design for tapestry. I am using a very ancient technique, weft-faced pictorial weaving, to try to convey something meaningful, even sacred, to a contemporary audience. I am inspired, as Janet Cardiff was, by an ancient piece of art, (see this post), and I am reworking the image from my contemporary perspective. Actually, artists are always responding to and reworking the art from decades, or centuries, before our own. I am excited to have discovered Tallis' music, thanks to Janet Cardiff, and enjoying listening to it as I work in my studio. For over a year now I’ve been working on a series of tapestries inspired by this icon of the Virgin Mary. The icon dates from the sixth century CE and is located in the Santa Francesca Romana church in Rome, Italy. There’s something about Mary’s direct gaze, and the aged, battered surface of the painting, that I find incredibly powerful, haunting and mysterious. I want my own tapestries about Mary to communicate that compelling mystery in a contemporary and personal way. Let me back up. My own given name is Mary, though everyone has always called me Molly. So as a child I paid special attention in Sunday School to stories about the Virgin Mary, especially the verse about how she “pondered these things in her heart.” (As readers of this blog will learn, I myself am a ponderer from way back. Perhaps an over-ponderer.) And growing up female in the church, it was apparent to me that many folks considered Mary to be an important role model for women, for her motherhood, for her submission to the will of God, for her traditional purity and beauty. And yet—who can possibly live up this standard? So for awhile now I’ve been reading up on Mary and looking at works of art depicting her. Pondering. To see the first three tapestries in this series, click here. This new tapestry I'm working on is based on a collage and a quotation. The quote is from the great theologian St. Augustine: “The truth of Christ is in the mind of Mary; greater is what she bears in her mind than in her womb.” Pretty shocking, right? For Augustine, Mary’s imagination, her vision and the courage to say Yes to the angel Gabriel when he informed her that she had been chosen to bear the Son of God, is even more remarkable than the fact that she gave birth to Jesus Christ. Here on the left is the collage that is the kernel of the design for this tapestry. You can see Mary’s face from the icon, an image of a cave (some believe that is where she gave birth, not a stable), and a gold arc shape on one side. The cave image is outlined into the basic shapes I will weave, and the numbers indicate color and value changes for the yarn I will use. I started serious work on this design in a workshop I took in October with the other members of Tapestry Weavers South, led by the incredible Scottish tapestry artist Joan Baxter. I finally started weaving this piece last week. On the right you can see where I am so far. 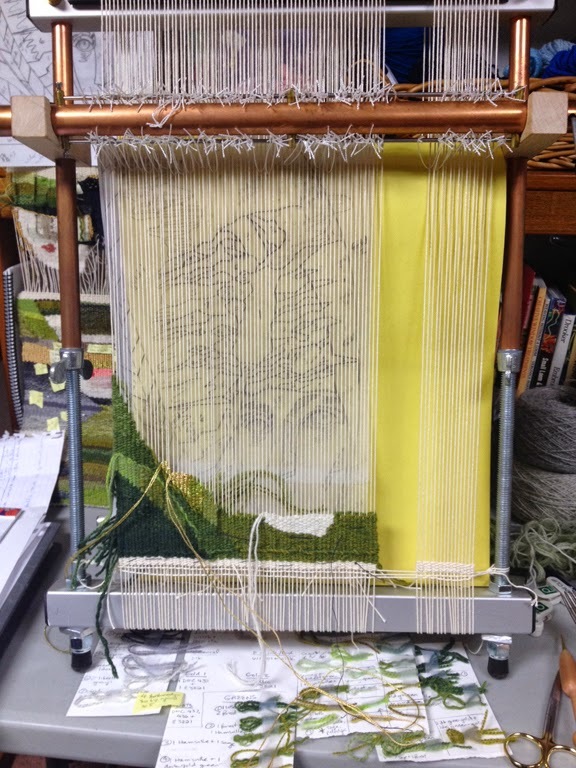 You can just make out the black and white line drawing (or cartoon) that is my map for the piece behind the weaving. (The yellow is a piece of paper that makes it easier to see the vertical warp threads.) I added the green areas to the original collage, and I've just started weaving the bottom of Mary's face in white. Watch this space for further updates! And thanks for dropping by.